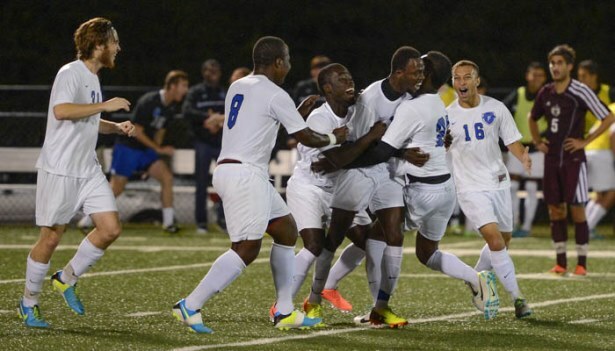 MONTGOMERY, Ala. – Ibrahima Seck‘s second half bullet was all it took for Faulkner to knock off Mobile in tonight’s Southern States Athletic Conference showdown here at John Mark Stallings Field. The victory marks the Eagles’ first-ever over the Rams. Faulkner orchestrated a strong attack early in the game, out-shooting the visitors 10-to-3 in the first half. Despite the aggressive assault, however, the Eagles failed to ignite the scoreboard. Seck changed all that in the 58th minute when he collected a rebound off a Faulkner free kick and hammered a shot by the back line for the game’s lone goal. Mobile refused to go quietly however, and took control of the tempo late in the game. The Eagles found themselves pinned deep in their own territory with the clock winding down, but brilliant work by Pritchard Ndaira in the net anchored a defensive stand the Rams couldn’t overcome. Ndaira (3-8-1) secured the win with three saves, all of which were in the second half. Faulkner improved to 3-8-1 overall and 2-4 in the league. The Eagles host Spring Hill in another SSAC matchup on Saturday at 6 p.m.